The blue color is bright and light. The checked area at the top leans towards historical graphic design for the company, and you are left in no doubt who makes they Chips by the large lettered name beneath this. Below all this however, is an old fashioned design of some Chips and large writing that you cannot read clearly because it stretches around the bag. Kettle Cooked Chips are always thicker than regular Chips. They are always firmer. They are always crunchier. These were exactly what it says on the pack, good old fashioned crunchy Chips. 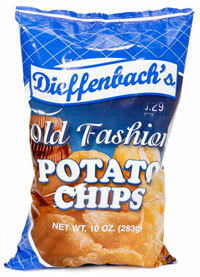 The fact they say they are Old Fashion on the pack makes you yearn for an old fashioned flavor and texture. There are some oil bubbles, but not many were broken, which suggests a thicker than usual Chip. There was some light seasoning and some lightly greased fingers after a bag plunge. These Chips would be called Ready Salted or Plain in other parts of the world. The seasoning was minimal but enough to bring out the oily potato flavor. If you like plain, potato flavor, you are likely to enjoy these.